Most salsa usually involves dicing up tomatoes and adding aromatics (onions, garlic, pepper). This unique salsa has a couple of twists from the traditional. 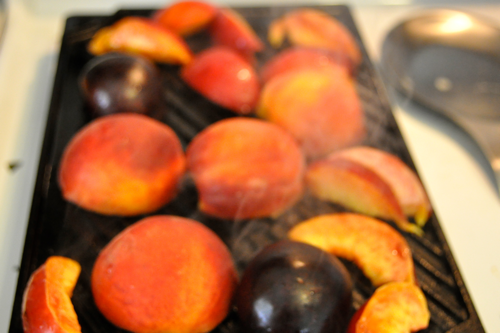 First, it is made up of stone fruits: peaches, nectarines and plums. Next, it is not spicy at all. 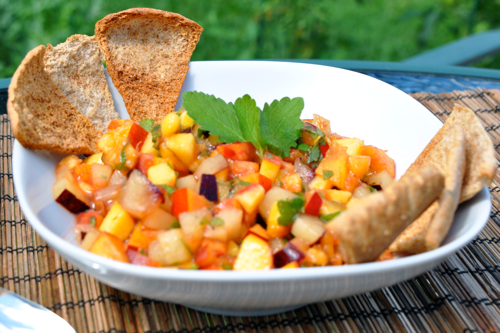 This fruity salsa could be a healthy dessert or a great snack. Lastly, the fruit in this salsa is grilled to add another level of flavor and complexity. Enjoy another great grilling recipe for the summer! Cut all stone fruit in half around the pit, remove pit and arrange on sheet tray. 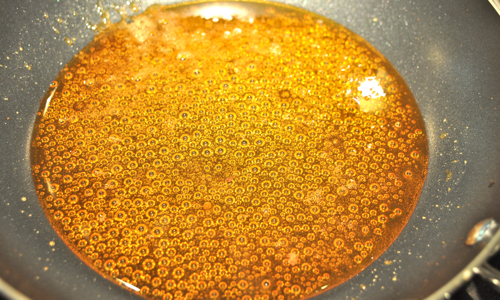 Combine melted butter and 1 tablespoon of honey. 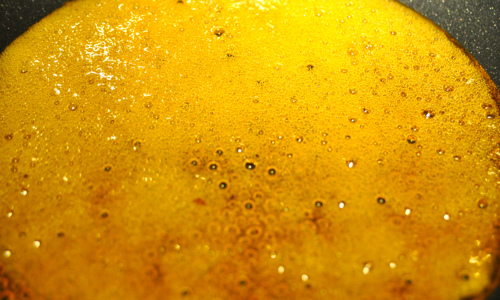 Brush the flesh side with honey and butter mixer. Meanwhile, heat grill until very hot. Once heated, place flesh side down. Let cook 1-2 minutes or until char marks are formed. 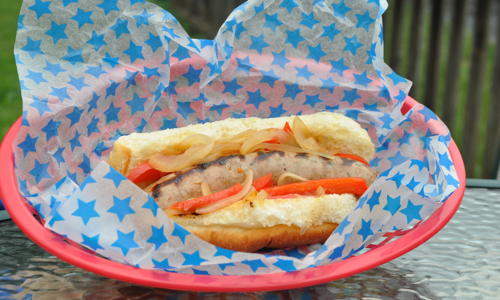 Remove and place on parchment lined sheet pan. Once cool, dice. Combine with remaining ingredients. Garnish with whole lemon balm leaves. If you cannot find lemon balm, you can use lemon verbena, basil or mint instead. Enjoy as a healthy snack or place over yogurt or ice cream. The fruit alone can be eaten with ice cream or yogurt as well. Tip- Chiffonade, this word sounds much more complicated than it is. This culinary term means to shred. In order to do this, stack a few leaves and roll up. Slice vertically in to thin shreds. It helps if your knife is very sharp. This can be done with mint or basil as well. It may be used on spinach or other greens to create a beautiful quick cooking greens, that can be sautéed or cooked in broth. 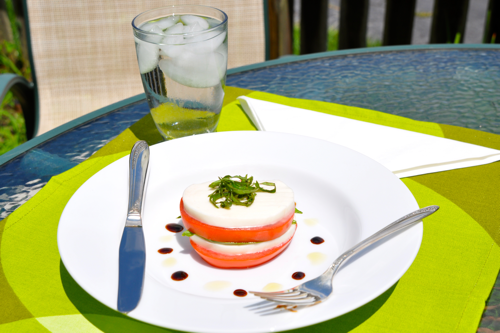 A caprese salad is a classic in Italian cuisine. It is made made up of very limited ingredients: tomato, basil, and mozzarella. This may not sound too enticing, but when tomatoes are in season and full of flavor, it can really blow your taste buds away. It is a very elegant, yet simple dish that can be plated in a multitude of ways, to be enjoyed by all. 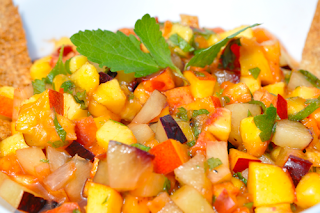 This a great salad to bring to a summer party or used to impress your guests. As I mentioned previously, ingredients are vital to this dish. 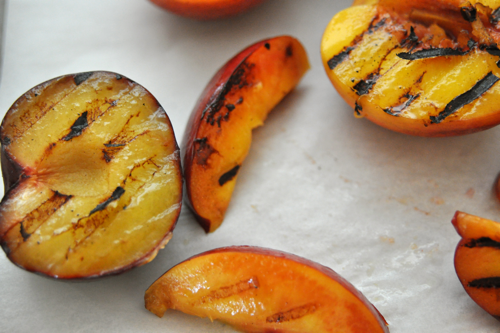 I would never attempt this in the winter, when tomatoes are not in season, and lack flavor. Home grown tomato make this salad phenomenal! 2 Beefsteak Tomatoes, sliced 1/4"
1 Ball Fresh Mozzeralla, sliced 1/4"
Season tomatoes with salt and pepper. 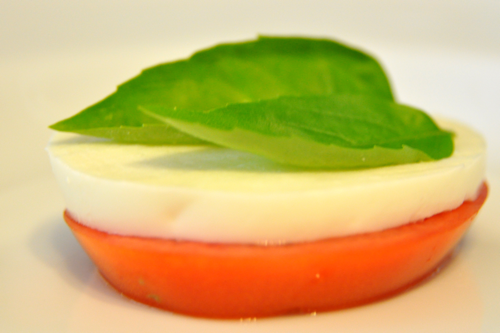 Arrange tomato, mozzarella and basil in a stack. Repeat the layers and garnish with a chiffonade of fresh basil. 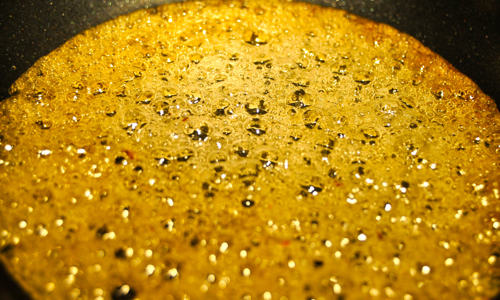 Drizzle with balsamic, olive oil. Enjoy! It can be chopped or lay flat on a platter for a different presentation. Depending on the amount of people or the occasion! Enjoy those wonderful tomatoes with this salad. 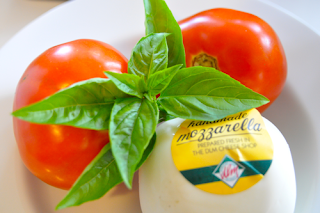 Tip- Fresh mozzarella or buffalo mozzarella. This Italian cheese is often found stored in whey or vacuum sealed packages. It has a completely different taste and texture from the mozzarella used on your pizza. It is a somewhat soft cheese with a very clean and yet slightly salty flavor. There is no substitute for this cheese. Almost every grocery store stocks it these days. If you have a local or specialty store that sells it, go for it! It is best eaten the same day that it is made. If you haven't tried this amazing cheese, you are in a for treat, this is not the mozzarella cheese you ate as a kid. The warm weather and extended daylight hours provides plenty of time to get outside and ride bikes, take a walk, go for a swim, or just lounge around and enjoy the sunshine. Summer is a great time for seasonal ingredients in Ohio! The farmers' markets are filled with a variety of local produce. When I make my weekly grocery list, I love to buy what is currently in season. The food is super fresh which tastes much better, plus since it doesn't have to travel far it is usually cheaper. Depending on your location, you may have slightly different items available. Here is a list of some items that are in season right now in Ohio. Each of these leave a variety of possibilities to create wonderfully seasonal recipes. Enjoy what's in season and experiment with all the possibilities. Candied walnut nuts are a favorite of my family and friends. They are often used on salads as a topping to add to the variety of flavors. 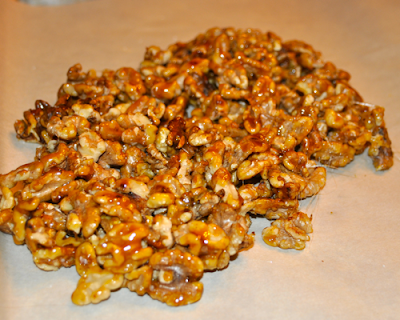 Candied nuts are also delicious on their own, and can even be used in cookies and cakes. When placed in a nice bag with a ribbon, they make a great edible gift. This technique can be done with any nut you have on hand. I have used candied pine nuts, almonds, and pecans in past dishes. 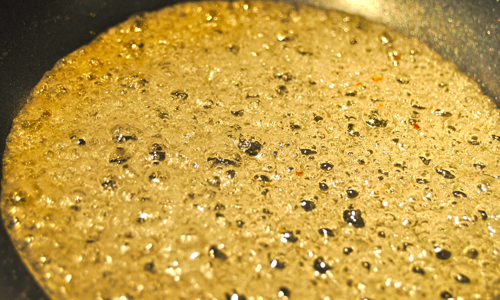 The basis of this recipe is to create a caramel by melting and heating sugar,which will darken due to the Maillard reaction. 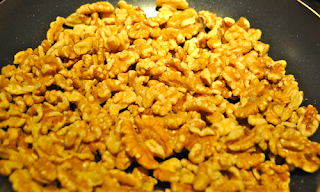 The caramel while still hot is used to coat the nut of your choice. Heat sugar and water until boiling and do not stir. Slowly the mixture will start to turn brown around the edges. 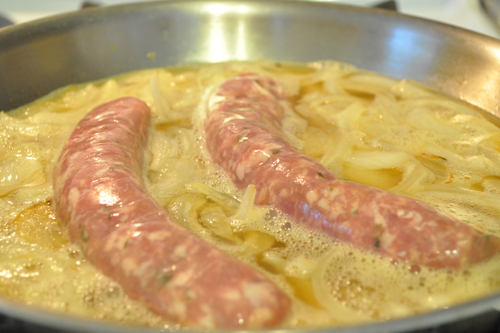 When this happens, swirl the pan or stir slightly for even browning. 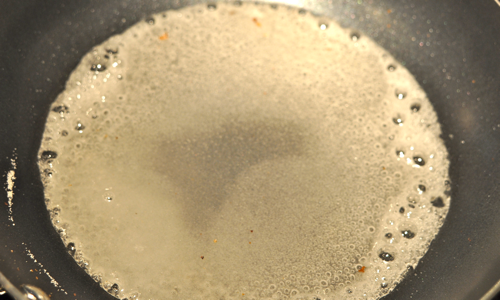 After the mixture has turned completely brown, turn off heat. Add vanilla and salt. 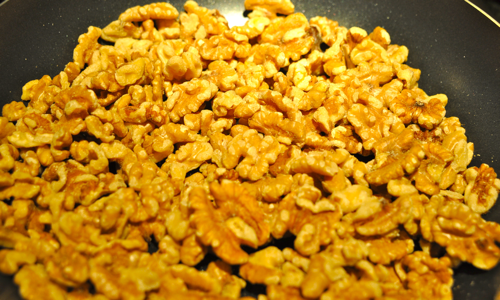 Stir in toasted walnuts. Let cool on lined sheet pan. Then break apart. Tip- Melted sugar is VERY HOT and sticky. Be very careful, as it will easily stick to you and leave a nasty burn. Never touch cooking sugar until it cools down. 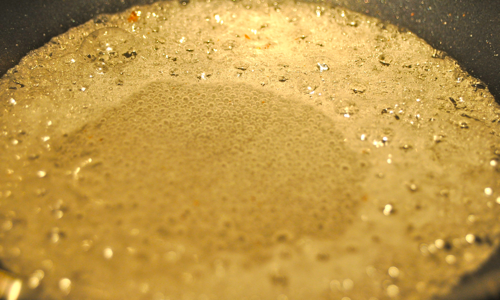 This is a basic caramel and it can go from done to burnt in a few short seconds. So keep a close eye on it and don't leave the stove. 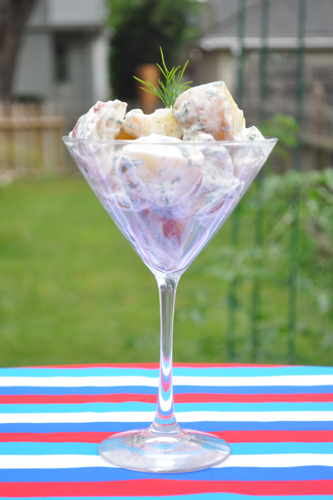 Potato salad is an American classic, and an important cornerstone in all fourth of July festivities. My take on this classic is healthier because I leave out mayonnaise and the sugar that many restaurants and stores add. This is just a fresher, more modern take on a classic dish, it is a cross between the classic French potato salad and the American version. 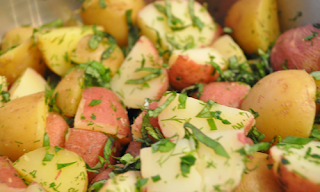 Place potatoes in a pot full of cold water. Heat until boiling and cook potatoes until a knife goes through easily. Drain and cool. Once cool cut into quarters and set aside. Add chopped herbs to cooked potatoes. For dressing, combine vinegar, yogurt, sour cream, mustard and salt and pepper. Toss with dressing. Tip- Buy potatoes that are all close to the same size. This will help them cook in the same amount of time. If you have some larger potatoes, cut them down to size. If you are in a hurry, quarter them first and then cook, this will help them cook and cool faster. Ever have trouble trying to pick out healthy food when shopping? The grocery store can make this task a difficult one. There are so many already prepared goodies and free samples of them. How do you navigate with so many choices and still get a great dinner on the table? It can be hard to make nutritious choices, when there is so many options. Here a few tips to get you through with a healthy cart. The perimeter of the grocery store has the most nutritious foods. This includes: produce, dairy, meat, and seafood. The produce allows you to get fresh fruits and vegetables. Load up on these foods for snacks and as sides for lunch and dinner. Buying a rainbow of colors in produce helps to get all the nutrients necessary and give some variation in your diet. The dairy section contains low fat yogurts, milk and cheese. This will help you get the Vitamin D and Calcium you need. Try to stay away from a lot of heavy cream, cream cheese and other highly processed dairy foods. The meat section is a great way to get your protein and add variety to your meals. 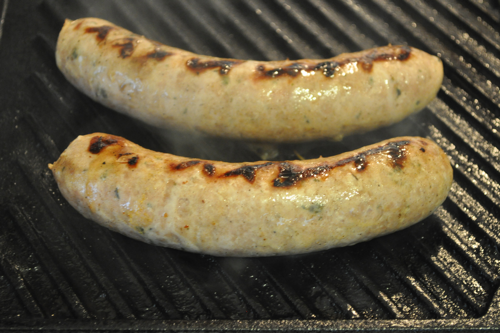 Great lean meat options include chicken breast, turkey, flank steak and pork loin. The seafood department has many nourishing options between the lean fish, hearty shrimp and omega three fish such as salmon and arctic char. 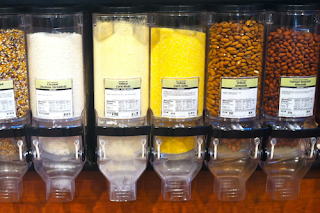 It is a exceptional place to get your protein and explore some alternative protein sources. The corollary to shopping around the perimeter is to avoid buy too many products from the inner isles of the store, which tend to be highly processed. These foods have scientific sounding ingredient lists that go on and on. Most of the time they lack many of the needed nutrients and are loaded with preservatives. Items in these isles are generally high in sodium, sugar, and fat, which can have multiple negative effects on the human body. These foods have a long shelf life, but that is accomplished by loading them full of preservatives. Longer shelf life, generally means less nutrients. However, there are exceptions, such as: canned tomatoes, dried beans or canned beans, spices, bulk items, nuts, whole grain pasta and other whole grain products. These are important items to keep on hand in order to help make a quick meal. Canned tomatoes can be used to make an impressive sauce or added to a variety of dishes. Beans can be used as a protein in a side or salad. Spices add many nutrients and antioxidants to your meal. Whole grains add fiber and are a great starch to have with your meal. Nuts are great as a snack and be used in a variety of ways when cooking. The nutrients in frozen fruits and vegetables are far higher than in their canned counterparts. Frozen fruits and vegetables are picked at the perfect ripeness and then flash frozen. This allows the nutrients to be locked in at their peak. Taste is much greater and truer in these item as well. Canned foods are loaded with sodium and have a long shelf life due to the processing that is involved in order to preserve food this way. If fresh is not available, frozen is the way to go. It is optimal way to keep wholesome items on hand as well. I always have frozen peas, spinach and mixed vegetables in my freezer. I can use these items to make last minute meals or side dishes. 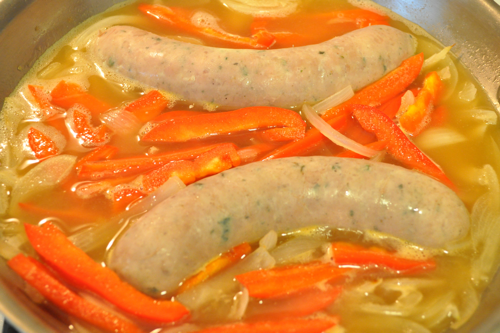 They can also be added to soups, sauces, curries, and rice for a nutritional boost. An important part of shopping is reading food labels. This may not be something that you are in the habit of yet, but is very beneficial. It is important to know what is being digested in your body. A good rule of thumb is the shorter the list the better. The more ingredients in the food item usually the less healthy that item. More ingredients often means more preservatives. A second rule is if you don't know what an ingredient is don't eat it. When you don't understand what is on the label, you probably don't want to eat it. Food items should have a simple list with ingredients which you can pronounce and understand. Most of the science terms on food labels are often preservatives. Buying bulk food is a marvelous in terms of nutrition. You can get great healthful items here such as nuts, brown rice, quinoa, steel cut oats and many others. When you buy these items here you save money because you are not paying for packaging. You can also just get the exact amount you need. This can make buying healthy more affordable. One of the best ways to support your community and your health is by buying local. 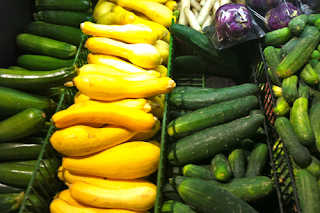 Many grocery stores label food that has specifically come from a local source. Buying local gives you the most nutrients available because it did not have far to travel before you purchased it. The sooner an item is consumed after being picked the more nutrients are in it. Shopping at farmers markets are a great way to get local ingredients and products. No matter where you live, you can find some great products and produce from local farmers. There are often free samples to try so you can know what you like. Also beneficial is that they can answer any questions you may have, which is a great way to learn. Buying local products and produce is a great way to support your community! I personally try to buy organic as much as possible. It is not always affordable so I keep to a general rule. The thicker the skin on a particular type of fruit or vegetable the less important it is to buy organic. Or if you are going to eat the skin buy organic. Items such as lettuce, nectarines, peaches, parsley, potatoes, cilantro, berries, apples, pears, and tomatoes, I buy organically. Items such as pineapple, bananas, and avocados have a much thicker skin so the pesticides do not penetrate into the fruit or vegetable as much. It is not as necessary to buy these organic. It is very important to bring a list when shopping. This helps you navigate and get what you really need. A list allows you to plan your menu. This way you can plan around what is on sale or what is already in your fridge. Sticking to a list will help you pass up on those impulse buys. It is much easier to buy healthy when you know ahead of time what you will be making. If I go to the store without a list, I tend to buy items that don't really make a complete meal. I end up with way to much of one item or not enough of another, and I tend to spend money on items I don't really need. Another very important tip to follow is: Do not shop on an empty stomach! When I am hungry, I often come home with twice as much as I needed, and I buys items I can't possible make before they go bad. A good time to go is after a meal like breakfast or lunch. This helps you make rational decisions and avoid adding impulse items to your cart. Do yourself a favor and have snack before going to the grocery store.